The most basic rule of deduction is that a simple explanation is far better than a complex one. The fewer assumptions one has to make, the fewer leaps of logic, the more likely it is that a conclusion is correct. So when we ask why the Georgia Republican Party is so dead set on spending $150 million to purchase voting machines that experts resoundingly agree are vulnerable to hacking, what’s the simplest explanation? That they don’t care? Maybe they want to get hacked. Or maybe they’re just idiots. Who knows!? The decision is so absurd, so entirely divorced from external reality, that trying to make sense of it is probably a waste of time. The only thing we can know for certain is that, undoubtedly, it is the wrong decision—and one that will ultimately put the integrity of the vote at greater risk. As Politico’s Eric Geller reported Thursday, Georgia’s increasingly irrational governor, Brian Kemp, is now poised to sign a bill that would replace the state’s voting infrastructure with machines that record votes in bar codes printed out on a slip of paper. (This as opposed to hand-marked ballots.) But cyber experts have repeatedly warned that the technology approved by the state’s GOP-led legislature can be corrupted in ways that are beyond detection. And yet they’re plowing forward anyway, experts be damned. In a sign of the times, the debate over which direction to take the state’s voting infrastructure was rife with dishonesty and misstatement. GOP legislators claimed, for example, that all of the options carried roughly the same amount of risk. Others said, falsely, there’s been no improvements to voting technology in decades. The lawmaker most fervently supporting this potentially disastrous decision, State Sen. William Ligon, has repeatedly mischaracterized the pros and cons of hand-marked ballots versus those generated by a computer. And it’s not as if he’s been robbed of the time needed to become better acquainted with the technology. His decision to ignore the advice of election security experts is a conscious one. At a time when America’s intelligence services are adamant that elections are, in fact, being targeted by foreign hackers, ignoring the advice of experts is, as Georgia Sen. Elena Parent told Geller, “a dereliction of duty” to the state’s taxpayers, whether they choose to vote or not. 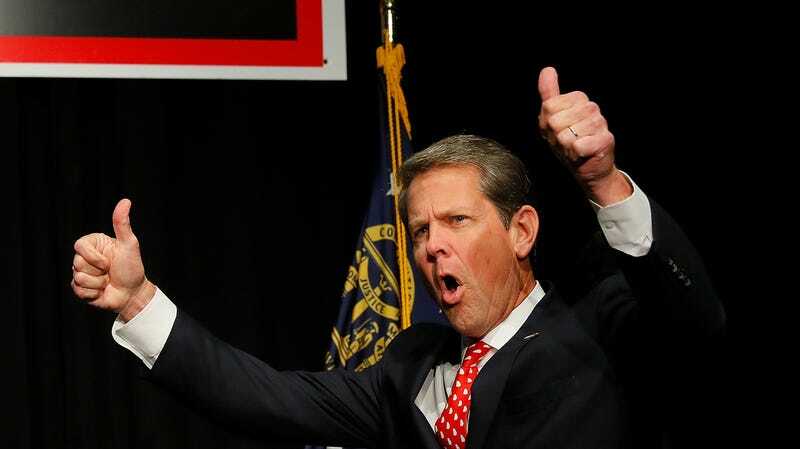 The only Republican who responded to the report was Sen. Kay Kirkpatrick, who told the paper there was “fundamental disagreement about whether machine voting or paper voting is more secure....” But that’s only true if you fill up a room, say, the Georgia State Capitol, with people who have little to no technical expertise in the matter. As with the climate change “debate,” you can either choose to believe actual experts or some out-of-touch politician who managed to weasel their way into office after spending their life doing nothing of value. So is Georgia’s GOP-led legislature corrupt, stupid, or just trying to get hacked? Since the state’s leaders seem determined to play Russian roulette with the vote either way, there’s really no point in trying to suss that out. Voting is a lot like consumerism: You get what you pay for. And Georgia is paying for what it got.